This window with its multi-paned glass and ornamental shutters is a study in creating interest by varying the same form. That form is the rectangle, of course. 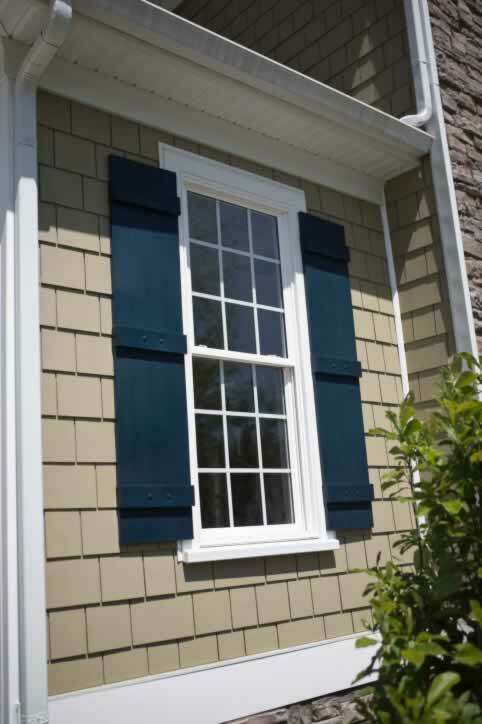 In the window, the 9-pane over 9-pane double-hung windows have slightly tall glass sections. The siding has alternating rows comprising wide and square shakes. The shutters are tall rectangles overall, but are made up of long planks and cross-angled braces. However, each plank's navy blue color makes these components blend into one subtle piece. This home's color scheme is brilliantly conceived - a warm clay for the siding, navy for the shutters, and sparkling white for the window frames and house trim. Note that while the muntins give the appearance of holding separate glass panes, they are instead sandwiched between double-pane energy-wise glass for easy cleaning. Brilliant indeed.